Buy 20 booklets of 10 KiwiStamp non-denominated self-adhesive postage stamps to send your letters and documents within New Zealand. 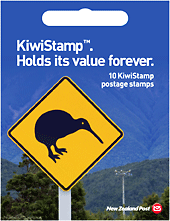 Each KiwiStamp postage stamp is worth the required postage of a Standard Post medium letter. Sending letters and documents within New Zealand. A postage stamp that holds its value.